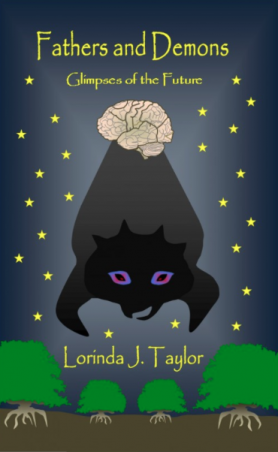 Lorinda J. Taylor, the talented author of several engaging and imaginative works of literary science fiction, does an excellent job of telling her potential readers what to expect from her latest independently published novel, Fathers and Demons; Glimpses of the Future. In the author notes section of her 116,000 word tome, Taylor makes it clear that her newest work is no ordinary novel. This reader found in Fathers and Demons (F & D) a mix of brilliance and beauty interspersed with passages of momentum-squelching exposition. Indeed, readers who favor a more traditional narrative would be wise to download the vendor’s sample for an initial perusal. That is because F & D is actually a prequel to the novel that Taylor eventually intends to release—The Man Who Found Birds among the Stars, the story of the first interstellar mission to discover extraterrestrials. That story, several times referenced with enthusiastic fanfare in F & D, is only weeks from launch when the reader commences Fathers and Demons. But before allowing her readers to embark on a light-speed trip to the stars, Taylor apparently believes it necessary to prime them for the journey. Hence F & D’s perambulatory (de)tour, one of the purposes of which (the author tells us in her introductory notes) is to depict “the history and state of Earth’s future civilization…” as well as “the future history of religion in general,” including “recounting what had become of certain remnant elements of society…”—specifically, the Jews. Armed with this agenda, Taylor commences F & D with an elaborately staged Jewish wedding. The year is 2768, the locale of the nuptials, one of the few remaining religious enclaves still in existence in her predominantly secular-humanistic future world order. Employing exhaustively researched detail, Taylor introduces a host of wedding guests, Jewish and secular, several of whom are slated to crew the impending mission to the stars. These include the mission’s super inquisitive (some might say annoyingly so) Captain Robbin Nikalishin and co-crew member, Com Officer Avi Oman (the groom), as well as Avi’s bride, Mercedes Tulu, a member of the mission’s ground command. The groom’s hospitable parents, Chaim and Naomi Oman, the amiable Rabbi Ely Kohn, and the Jewish enclave’s irascible Chief Rabbi, Ben-Ari, are also on hand—ostensibly to play an important role in establishing F & D’s thematics. Readers apt to tire from prolonged exposure to dialogue are forewarned that Taylor’s account of the matrimonial gathering encompasses 10 chatty chapters and some 70,000 (count ‘em!) words. This section of F & D, arguably too long by half, is marked (or marred?) by a crowded cast of guests and their hosts who sit and talk, and eat and talk, and drink and talk their way through a series of stories personal and epic—e.g., a page-hungry history of the Jewish people and their nameless G-d (Who must be referenced by the epithet, HaShem) and the tale of Rabbi Ben-Ari’s domestic tragedies, including the untimely death of his only son. In short order, Taylor—who admits to being a teacher at heart—uses these chapters to instruct the reader. More specifically, the author’s penchant for exposition and second-hand-after-the-fact storytelling (as opposed to real-time story showing) often robs her tales—and by extension, the characters and populaces to whom they belong—of their emotional and dramatic impact. In her introductory notes Taylor tells us (there’s that word again) that the first 10 chapters play a key role in her novel—namely, to introduce “The theme of fatherhood and the connections between fathers and gods … the mesh that will bind the book together”. Doubtless, that was Taylor’s intent; even so, F & D’s initial chapters do not pique a particular interest in thematics so much as inspire an almost irresistible urge to scan ahead. Only the fact that Taylor can actually write—and that with occasional bursts of disarming eloquence—kept this reader anchored on the page. Fortunately, chapters 11 through 14 afford a much-welcomed respite from the novel’s loquacious first section—not that there isn’t a fair amount of dialogue in these chapters too. The difference is that the story of Ian Glencrosse—Chief Engineer for the upcoming interstellar mission, and a man wrestling with his own demons—unfolds in real time. Nothing second-hand about it. Burdened by a prolonged estrangement from his parents and plagued by (delusional?) forebodings of a mysterious, malevolent interstellar God intent on the destruction of the upcoming mission, Glencrosse undertakes a pre-launch excursion to make a final peace with his progenitors. The end result of this journey is Glencrosse’s decision to make, when the moment presents, the ultimate sacrifice to his mysterious Star God. The fact that Taylor makes us wait for her next novel to learn if Glencrosse actually places himself on the sacrificial altar is, for this reader, more than a little frustrating. Even so, the chapters devoted to Glencrosse showcase Taylor at her best. A master of dialogue (when she doesn’t’ let it eat up reams of page space), Taylor ensures that Glencrosse’s interactions with his parents crackle with real emotion and nuanced, character-revealing details. In addition, the author’s prose is sometimes given permission to soar so that the reader begins to understand what makes Taylor a writer worth staying with—even when nothing much but talk is happening on the page. F & D’s final two chapters feature a foray into epistolary form—a detour that provides much-needed closure, as well as a strong dose of humanity, to the story of Rabbi Ben-Ari (who in the novel’s first section condescended, often quite rudely, to the wedding guests—particularly the goyim). These final chapters also provide additional insights into the character and leadership qualities of Captain Robbin Nikalishin, a man given in the novel’s first 10 chapters to frequent aw-shucks exclamations and expletives the likes of Holy cry! and Bloody Hell! Here we finally get a glimpse of the commanding eloquence and empathy that (Taylor keeps telling us) has made Nikalishin a global hero. In conclusion, F & D provides ample evidence of Taylor’s authorial gifts and potential, as well as an occasional appetizer for her next offering, The Man Who Found Birds among the Stars. Hopefully she won’t keep us waiting long. 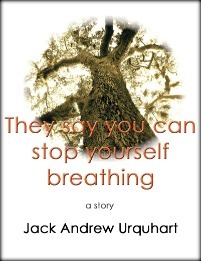 This entry was posted in Uncategorized and tagged book reviews, Every Man Jack, Fathers and Demons, Independently-published authors, Jack A. Urquhart, Jack Andrew Urquhart, Lorinda J. Taylor, sci-fi, science fiction. Bookmark the permalink.